It may only be September but it’s never too early to start thinking about the holidays – especially holiday party season. Now is the time to pursue holiday party bookings, both for corporate holiday parties and private holiday parties. The good news is TapSnap is a natural fit. After the night is over, TapSnap’s photos remind guests what a fun time they had. Last year in Vancouver, TapSnap made the rounds of corporate holiday parties including the Bright Ideas - BCAA Viva Las Vegas Xmas Party at the Hyatt Vancouver, Vision Critical’s Christmas Party, and the BC Children’s Hospital Foundation’s Crystal Ball, which was sponsored by the Vancouver Sun. TapSnap allows party guests to take pictures that can be branded with a corporate logo, add fun digital props like Christmas hats and reindeer ears, and use green screen technology to have a customized corporate background. Event guests can also share their pictures instantly on social media. TapSnap also provides a facilitator who supervises the use of the machine and encourages people to have fun. 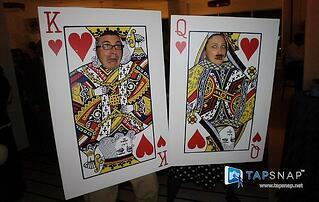 "TapSnap was a huge hit at our holiday party," said Vision Critical’s Sofie Marricks. "Everyone has commented on how lovely the people running the photobooth were. We will definitely be using it again! They run a great service."